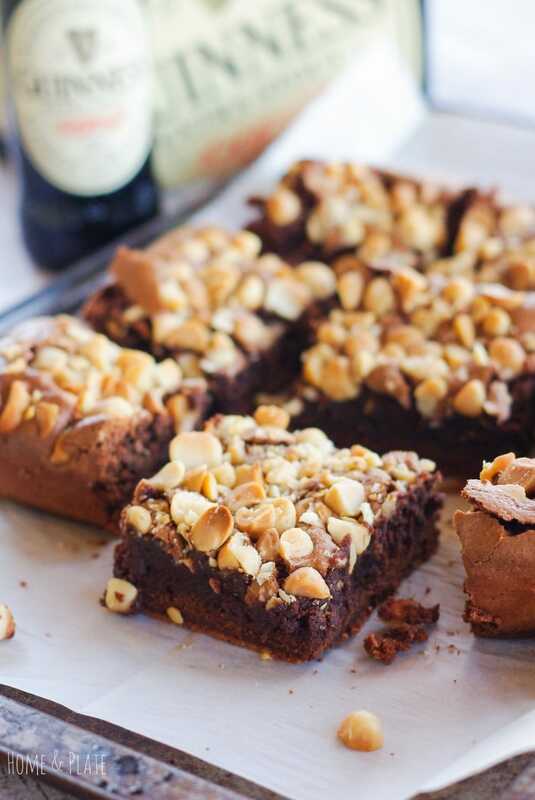 These Dark Chocolate Hazelnut Brownies are moist and nutty and include a secret ingredient that amps up the flavor – Guinness Beer! Who said Guinness is only for St. Patrick’s Day? I love cooking with it and have decided that Guinness and chocolate belong together. St. Patrick’s Day maybe over but my love affair with Guinness Stout is not. I really prefer cooking with this dark ale than drinking it. I decided my next experimentation would be using this dark malt flavored beer in a brownie. The Guinness beer is a magical ingredient that simply amps up the flavor of chocolate. 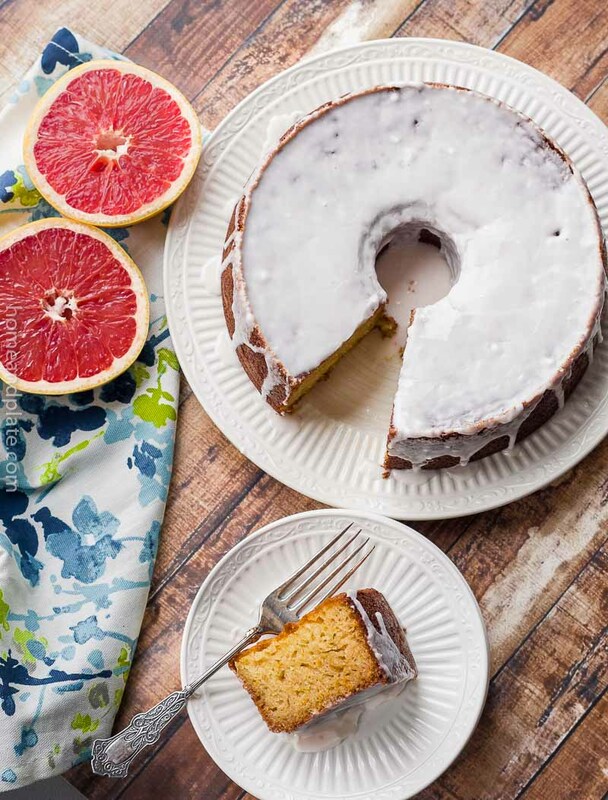 And no worries if the kids reach for this dessert because the alcohol cooks off naturally. The result is a moist, nutty and decadent dessert. Can I use Guinness beer in my recipes? Absolutely! I’ve used Guinness Stout to sauté mushrooms for a unique side that goes with any grilled meat. And I’ve used the beer to make an ice cream float. And this beer adds great flavor to brownies. There are various Guinness chocolate brownie recipes online but none that include hazelnuts. I’ve always been a fan of additions to my brownies. Oreo cookies are a delicious add-in to amp up a regular chocolate brownie. Fan of Smores? My Smores brownies are a kid favorite. 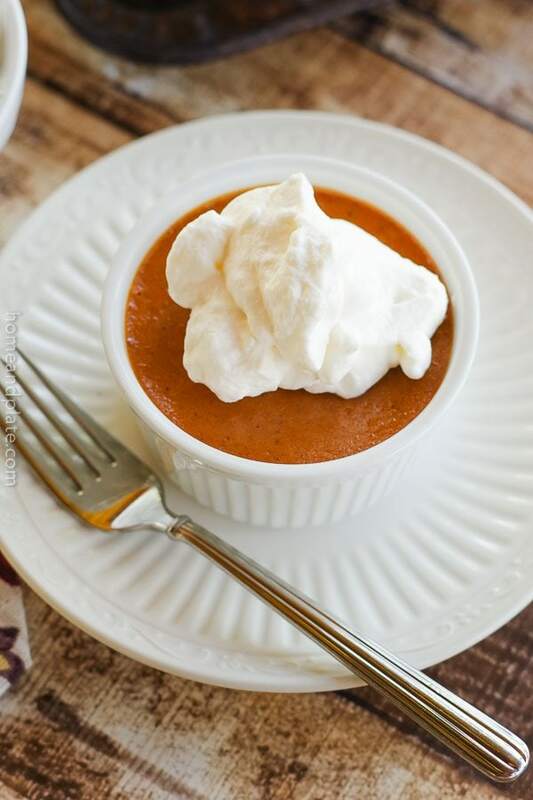 I’ve even been known to mix and pumpkin for a perfect fall sweet treat. I picked up a bag of dry roasted hazelnuts at the grocery and an idea was born. These brownies are no different. They are easy to whip up in under 45 minutes and are delicious on St. Patrick’s Day or any day of the year. I reduced the beer to concentrate the flavor and I also added baking soda to make sure the batter firmed up during baking. I mixed the ingredients just enough to blend. 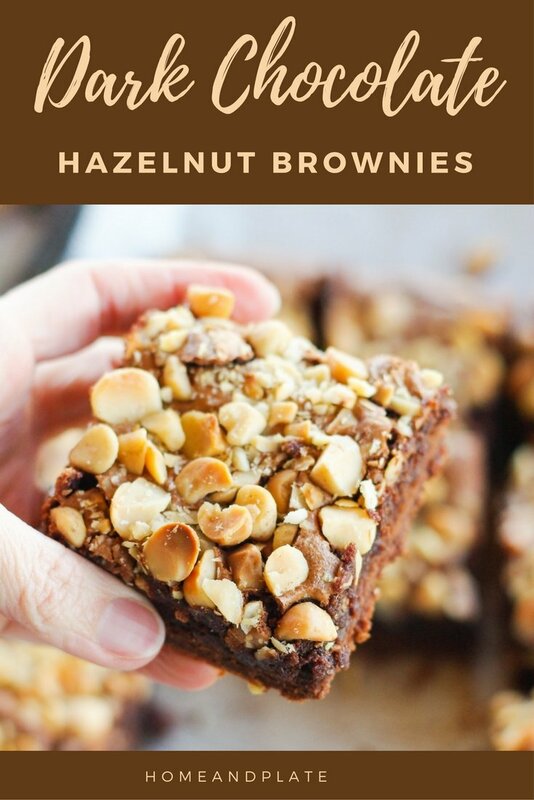 I topped the brownies with dry roasted sea salted hazelnuts for a little added crunch. Delicious! 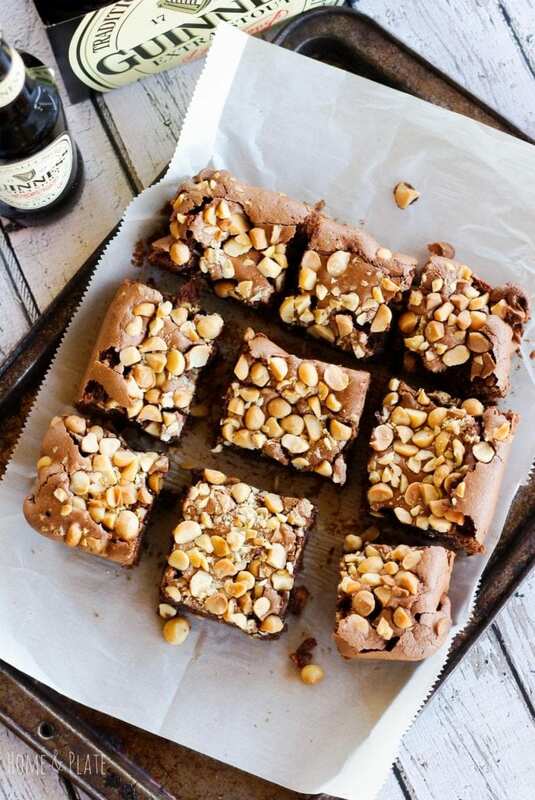 If you love beer and you love chocolate, these brownies will be love at first bite. These Dark Chocolate Hazelnut Brownies are moist and nutty and include a secret ingredient that amps up the flavor - Guinness Beer! Preheat the oven to 350°F. Line a 9 x 9 inch pan with parchment paper. Bring the beer to a boil and allow it to reduce by half, about 5 minutes. Cool completely. In a large enough microwavable bowl, melt the chocolate and butter until the butter has melted, about a minute. Remove the bowl from the microwave and continue to stir until chocolate is completely melted. Pour the melted chocolate and butter into a large bowl or stand mixer. Add in the cooled beer, sugar, eggs and vanilla and beat until the sugar has dissolved. Mix in the flour and baking soda. The batter should be glossy with no bubbles. Pour the batter into the prepared pan and top with the chopped hazelnuts. Bake for 45 minutes until a toothpick inserted in the center comes out clean. 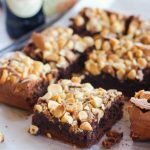 "description": "These Dark Chocolate Hazelnut Brownies are moist and nutty and include a secret ingredient that amps up the flavor - Guinness Beer! 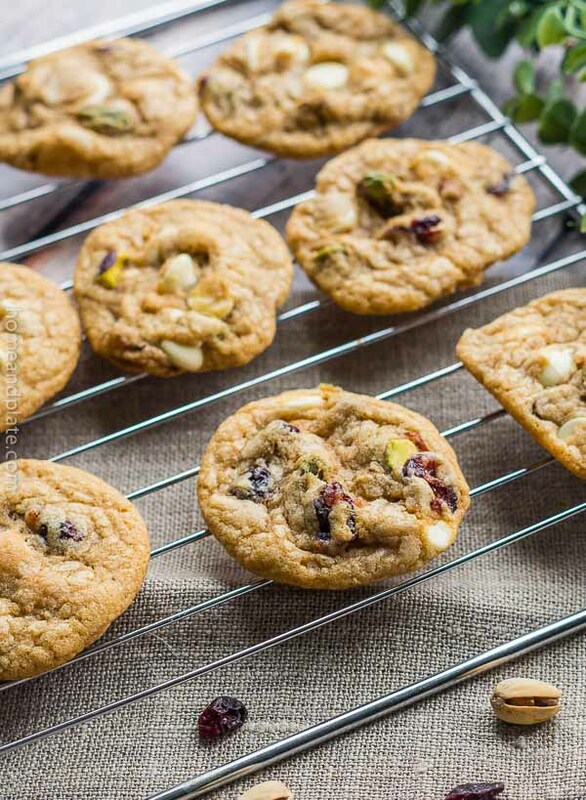 ", "recipeIngredient": [ "1/2 cup Guinness Stout", " 6 ounces Dark chocolate chips ", " 1/2 cup butter, 1 stick", " 1.5 cups sugar", " 3 eggs", " 1 teaspoon vanilla", " 1/4 teaspoon baking soda", " 1 cup flour", " 1/2 cup chopped dry roasted hazelnuts" ], "recipeInstructions": "Preheat the oven to 350°F. Line a 9 x 9 inch pan with parchment paper. In a large enough microwavable bowl, melt the chocolate and butter until the butter has melted, about a minute. Remove the bowl from the microwave and continue to stir until chocolate is completely melted. Pour the melted chocolate and butter into a large bowl or stand mixer. Add in the cooled beer, sugar, eggs and vanilla and beat until the sugar has dissolved. Mix in the flour and baking soda. The batter should be glossy with no bubbles. Pour the batter into the prepared pan and top with the chopped hazelnuts. Bake for 45 minutes until a toothpick inserted in the center comes out clean. Interesting addition of Guinness, bet it really adds to the richness, yum! It does Bintu…it adds such deliciousness to so many baked goods. I love using Guinness in baked goods! These brownies look so awesome! I love that they are dark chocolate!! Guinness is so tasty in so many desserts. I use them to saute mushrooms too for an incredible flavor. Thanks Elaine. Yes…beer in these brownies make them the most delicious and so moist. I think you’ve just created the perfect brownie! Dense and thick bottom – crunchy and light on the top. Can’t wait to try these! I hope you love them. Thanks Nicola. That is literally inspired! Genius! Hazelnuts, chocolate AND beer?? Holy cow!